A gateway to the Côte d'Azur and Monaco, Nice Airport is the third busiest airport in France and is located a short drive from the city of Nice. Our guide to the airport includes important contact details, information regarding airport facilities and details of public transport routes. Nice Côte d'Azur Airport will be connected to Nice's tram network by 2019. Nice Côte d'Azur Airport has good road links to Nice, Monaco and Italy via the Promenade des Anglais; it is also linked to Cannes and Antibes via the A8, RN 98 or RN7, and to Digne-les-Bains and Grenoble via RN202. Nice Côte d'Azur Airport is located 7km (4 miles) west of Nice. Bus:Lignes d'Azur buses 99 and 98 (tel: +33 8 1006 1006; www.lignesdazur.com) run regularly between the airport and city centre. The single fare is €6 (this is a day ticket valid for bus travel anywhere in the Côte d'Azur) and the journey takes approximately 20-30 minutes. Taxi:Taxis (tel: +33 4 9313 7878) are available 24 hours a day; stands are located outside Arrivals at both terminals. Fares to central Nice range from €22 to €30 during the day and €27 to €32 at night. Rail:SNCF regional train services (tel: 3635 [inside France only]; www.ter-sncf.com) run from Nice St Augustin railway station, situated 500m (1,640 ft) from Terminal 1. The single fare into the city is €1.80. SNCF services to other national destinations run from the central station in Nice, which is connected to the airport by bus 99 (SNCF Direct) from Terminal 2 and bus 23 from Terminal 1. Helicopter transfers to Monaco, Cannes and Saint-Tropez are also available. Azur Helicoptere (www.azurhelico.com), Heli Air Monaco (www.heliairmonaco.com) and Monacair (www.monacair.mc) are amongst the operators. Nice Côte d'Azur Airport has banks and ATMs in both terminals. A bureau de change service is also available. Gift shops, newsagents and duty-free shopping (for passengers leaving the EU) can be found in both terminals. There are also outlets selling regional speciality products. Left luggage facilities are located in the Terminal 2 Service Centre (tel: +33 4 9321 3111). Porters (tel: +33 6 9825 2106) are available in both terminals and can be called from the information desks. For items lost at the airport, contact the lost and found office (tel: +33 4 9321 3111), housed in the Service Centre in Terminal 2. Nice Airport has a pharmacy in Terminal 1 and a vaccination centre in Terminal 2. Baby changing facilities are located in both terminals. There is also a prayer room in Terminal 1. Free Wi-Fi internet access is available throughout Nice Côte d'Azur Airport, and there are also several fixed internet stations. Additionally, a post office is available at the airport. Facilities for disabled travellers include lifts, ramps, travelators, accessible toilets, telephone booths and adapted ATMs – all car parks provide spaces for disabled passengers. Wheelchairs can be provided by airlines; disabled travellers should notify their carrier when booking. Ulysse Transport (tel: +33 820 825 800; www.ulysse-transport.fr) provides transport for disabled passengers to/from the airport; reservations can be made online, via phone or by using the courtesy phones in the arrivals halls of both terminals. There are numerous car parks providing facilities for short- and long-term parking at both terminals. The new P6 car park, near Terminal 2, offers a more flexible 'intermediate' parking option with a number of fixed-term packages. 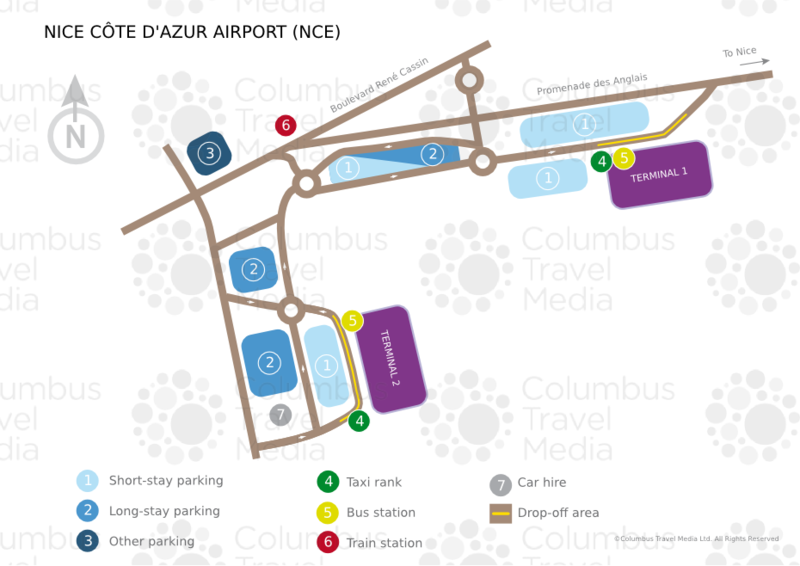 Car hire companies at Nice Côte d'Azur Airport include: Avis, Budget, Enterprise, Europcar and Hertz. Desks for these operators are located on the arrivals levels of both terminals. Vehicles are collected from and returned to the Car Rental Centre, near Terminal 2. This is reached via the Terminal 2 shuttle bus from Arrivals.